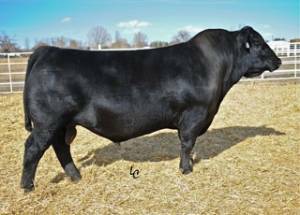 A semi-proven performance and carcass bull with an outcross pedigree to most lines of top growth cattle. He is big and thick, with great feet and legs and the ability to sire good females and scale pounding fed cattle. An elite sire for WW, YW, SCR, DOC, CW, MARB, $F, $B and others! He has outstanding EPDs and is ideal for many with his moderate BW and MILK.